This is an experiment -- I've IDed most of Katsi's plants by their botannical names (there's a couple of problems) and used this to find ID pix all over the web. By Indian language, I ID them by the Mohawk names she gives, the Anisninaabemowin ones I happen to know, and any other Indian names I learn. I'd like to collect as many Indian names (and info on their uses) from other tribes as possible. This would be a good student project, especially when (if ever) spring comes -- try to ID the plants in your area, talk to elders, etc., send me the info and I'll add it to the plant notepages for Katsi's article. Katsi, a presenter on Native childbirth, photographed at the 1994 Indigenous Women's Network Gathering at White Earth Reservation, Minnesota. Theme was Sustainable Communities: Our Future, Our Responsibility. Fashion note: she's wearing an IWN T-shirt. Wildberries remind us of our childhood. Indeed, they are a special gift of Creation to the children and to women. Over 250 species or berries and fruits--strawberry, red raspberry, currant, elderberry, juniper berry, cranberry, bearberry, to name a few - in Native America are gathered and utilized for their nutritional and medicinal value. Berries are delicious when eaten raw, crushed and mixed with water and maple syrup or honey for drinks; mixed with soups, bread, puddings and meats, and dried for winter storage. The berries, leaves and roots can be collected and used together or separately and drunk as a medicine tea. Among the Haudenosaunee (Six Nations Iroquois), the wild strawberry is regarded as the "leader" of the berries. It is the first berry food to appear in the spring and this sacred plant is gathered at that time and eaten as a blood purifier. The iron and minerals in the berries and leaves of the wild strawberry make this favorite berry plant a valuable blood remedy. Elderberries, red raspberry and tender sumac berry sprouts are also used for their alterative, or blood-building, properties. Wild berries are extremely rich in vitamin C. Vitamin C is a water-soluble nutrient which detoxifies the body, promotes healing, strengthens connective tissue, helps to absorb iron, and cooperates with the B complex in maintaining the endocrine system. A severe deficiency of Vitamin C leads to scurvy, a disease that was common in Europe at one time and which was attributed then to "bad air." Native peoples of Turtle Island had already recognized the dietary basis of the disease and they knew how to prevent and cure it with a variety of medicines from natural sources. Craspberries are antiscorbutic, meaning that they are effective in preventing and treating scurvy. They can be used alone or in combination with other berries like sumac berry and other natural sources high in vitamin C like the fresh, new tips of evergreens. Berries are also of great benefit to the urinary tract. They act as diuretics (promotes the flow of urine) and they acidify the urine to create a hostile environment for bacteria. Cranberry and bearberry have long been used in the treatment of cystitis (urinary bladder infection). Berries also have astringent properties, meaning that they cause contraction of tissue and they arrest bleeding and discharge. In this capacity, they are proven remedies for diarrhea and leukorrhea. 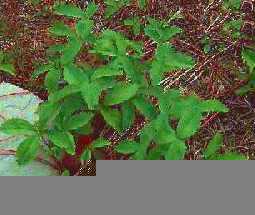 Blackberry root, in combination with wild strawberry leaves has long been known as an effective remedy of diarrhea. Blackberry root has also been used as a treatment for dysentery, a disease characterized by extreme diarrhea and passage of mucus, blood, pus and fluid. Kneeling upon soft mosses or standing at a bramble of thorny harvest; their quick fingers dancing across bushes heavy with their succulent fruit, our grandmothers gathered berries of many colors with joy and grateful recognition. They used the berry plant as a woman's medicine throughout their reproductive years for a variety of purposes. Some berry plants help to stimulate and promote normal menstrual function, others help to ease childbearing and childbirth; still others alleviate menopausal symptoms or are useful in the treatment of gynecologic complaints. Still today, Indian woman and children prize the various wild berries that grow in our territories and we will travel long distances and make camp and harvest those berries which aren't quite as near to home. We join our elders in their lament that gravel pits and concrete are causing the berry and other plants to "turn their faces from the people and disappear." Using the berry plants for both nutrition and medicine is one way that traditionally-minded woman can continue to keep their strength and health within the cycles of the creation. Begin by using those berries you were familiar with as a child, and seek the guidance of someone who is knowledgeable about the berries in your area to find the safest and most effective way to use them. If you are on your moon, or still bleeding from childbirth, do not gather the berries or any other plants. Have your grandmother, midwife or someone else you trust do it for you. If you are pregnant, there are some berry plants you shouldn't use, like elderberry roots. Although its okay to eat the cooked berries, the roots contain a toxic principle. Remember, too that although berry plants have much nutritional value, they are only meant to supplement and enhance a well-balanced diet. Like anything else, don't overdo it. More does not mean better. Above all, as whenever you harvest the Creation's gift, give thanks and acknowledgement to the Creator and to the plant, and return something to the Earth so that her cycles may continue. Springtime is traditionally a time of cleansing the body from impurities which accumulate in the system over the relative inactivity of winter. Just as every menstrual cycle includes the purification of the woman through her menses, it is also important that she cleanse her body in harmony with the earth's cycles through fasting or the use of bioactive plants. The whole strawberry plant; berries, leaves and roots - can be used as they appear in your area in the spring for purposes of cleansing the system. Both a blood purifier and blood builder, the wild strawberry is a laxative, diuretic and astringent. The leaves and berries are rich in iron and contain the minerals magnesium, potassium and sodium. It is a teaching of many native peoples that during menstruation and pregnancy the woman's body becomes highly toxic. At menses and childbirth, it is important for a woman to rest. She may also observe dietary restrictions such as not eating meat or salt. Wild strawberry leaves and berries can be used alone or in combination with other medicines to cleanse the woman's body during her moon time and following childbirth. Also, if you eat too many strawberries during pregnancy, the old women say, your baby will be born with a strawberry mark! Of all the berries, this is among the most useful for women throughout the reproductive years. The berries and leaves are rich in iron and they also contain minerals-phosphorus, potassium, magnesium- which help build the blood by carrying iron from stores in the liver, spleen, and bone marrow to needy tissues, the reproductive organs in particular. In pregnancy, tea made from the leaves is good for nausea. Its action on the uterus assists contractions and checks hemorrhage during labor and delivery. After delivery, it strengthens and cleanses the system and enriches the mother's milk supply. Raspberry leaf tea helps stimulate and promote normal menstrual function. Steep 1 tablespoon fresh or dried leaves to one cup boiled water, or 1 cut leaf to 1 quart boiled water for at least 5 minutes. Drink liberally throughout pregnancy, lactation and the menstrual cycle. Raspberry leaves can be mixed with other berry plants or with mint or honey to improve the taste and medicinal action. The lukewarm tea in combination with slippery elm can be used as a douche for leukorrhea (whitish discharge) of vaginitis or menopause. This berry was not generally used for food by humans, but was used by the women as an excellent tonic for the female reproductive area. Partridgeberry is a uniquely native american plant. It was called "Squaw vine" by colonists who saw Indian women using it, and it continues to be called that by people who don't know the meaning of the derogatory word "squaw." An infusion, or tea, of the entire plant is used several weeks before childbirth (do not use during the 1st or 2nd trimesters), and can be used after delivery during breastfeeding. It is a female regulator and tonic and can be used for all uterine complaints. 2. Bake at 350 degrees for 2-4 hours. 3. Remove plant parts from oil. 4. Melt beeswax in the remaining oil and plant mixture and mix. 5. Put in container and allow to cool. It should be a creamy ointment. If it is too stiff, heat again and add oil; if it is too thin, reheat and add beeswax. The Navajo name is given for this evergreen shrub because it is widely used in the southwest mountain areas as a stimulant and emetic. The needles are boiled and used for diarrhea and as a postpartum stimulant. Juniper berries can be dried and used for tea which has a laxative effect. Traditional Navajos use juniper as an emetic (causes vomiting) to purify the system of both adults and newborns. For adults, they say to put the leaves in warm water when you get up in the morning, before you have breakfast. Then go and run, and when you return, drink the liquid. It will make you throw up and purify your body. Matilda Coxe Stevenson, a sensitive female anthropologist who attended several births among the Zuni in the late 1800's, reports that juniper twigs and berries were steeped in boiled water by the Zuni and drunk by the expectant mother as a tea throughout labor and delivery and afterwards to relax her system and cleanse the uterus. She mentions, too, that the People believed that if they drank the tea in the earlier stages of pregnancy, the child would be very dark. The Recommended Daily Allowance of vitamin C during pregnancy and breastfeeding is 80-100 mg. This daily dietary requirement is necessary for the formation of strong cell walls and blood vessels, and it is therefore essential to the growth of the fetus and the placenta. Mohawk people would prepare a tea high in vitamin C for pregnant mothers which included white pine, cranberry and sumac branch bark. During pregnancy or oral contraceptive use, a woman faces increased susceptibility to urinary tract infection because of rising blood levels of a reproductive hormone called progesterone. Progesterone causes smooth muscle tissues, such as the bladder, to relax. It also causes the ureters, the ducts leading from the kidneys to the bladder to dilate. This action, in addition to the pressure of the growing uterus during pregnancy on the ureters and urinary bladder, may cause the bladder to become distended. The resulting increased volume of urine makes the urinary tract more hospitable to bacteria. It is important to drink lots of liquid to dilute the urine to keep the urinary system flushed out. Cranberry juice, best taken without sugar, contains hipuric acid which inhibits the growth of bacteria. Cranberry leaves can be made into a tea and taken postpartum to help prevent uterine infection in situations where the woman may seem at greater risk, such as cases of premature rupture of membranes. An extract of the bark of Blackberry roots and wild strawberry leaves make a fine treatment for umbilical cord cure. Indigenous Woman is an official publication of the Indigenous Women's Network, a continental and pacific network of women who are actively involved in work in their communities. IWN emerged from a gathering of around 200 Indigenous women at Yelm, Washington in 1985. Women came from the Americas and the Pacific to tell their stories, present testimony as to conditions, and to look for strategies and alternatives to make a better future for our families and communities. We discussed the issues of political prisoners, land rights, environmental degradation, domestic violence, health problems and other concerns which are pressing in our community. We learned from each other and we found courage in the experience. We wanted to continue this work. Four years later, the Indigenous Women's Network was formally organized by a group of women who were committed keeping up the links between women working in their communities, and finding a way to strengthen that work. Our philosophy is to "work within the framework of the vision of our elders," and through this process, to rebuild our families, communities, and nations. This publication is one part of that process. Indigenous women are invited and encouraged to submit articles, poetry and artwork/graphics within the visions of this magazine. Please do not send originals and include stamped, self-addressed return packaging for your items if you wish them returned. Katsi Cook, O. Seumptewa, Victoria Manyarrows, Cate Gilles, Richard Bancroft (photographer), Mark Dowie, Debra Lynn White Plume, Sarah Lons, Kay Miller, Dr. Melanie McCoy, Mililani Trask, Nora Naranjo-Morse, Buffy St. Marie, Allison Weiss, Ruth White, and Erika Zavaleta. CREDITS: Michelle Lord typed the above article and other info from Mohawk plantswoman Katsi Cook from issue IV (1992) of Indigenous Women's Network magazine. Subscribe or get single issues on-web at: this distributor. Michelle circulated Katsi's 1993 article on ind-know mailing list, a listserv whose participants from many tribes and indigenous nations are interested in traditional ways of agriculture, ethnobotany, remedies, foods, and especially environmental-ecological issues on native lands. It's been retrieved from the ind-know archive. I illustrated it with a photo of Katsi by Millie Knapp, ad will cross-link it to more info about each of the plants Katsi mentions here. CREDITS: Photo of Katsi by Millie Knapp for Indigenous Woman magazine. Photos of plants from University of Wisconsin Botany gopher. Drawings of moon, certain berry-buttons, by me. Article and other material from Indigenous Woman magazine originally retyped for ind-know maillist circulation by Michelle Lord. Webmistress --Paula Giese. Text and graphics copyright 1995, 1996.